We open back in 1924 and Seth and Cynthia are completely smitten with each other. He’s been going to church or at least hanging out near the church and making out with her and he wants to start a new life. Cynthia even suggests that he could be a preacher. But right now, he’s kicking people off their land and his father doesn’t care if it’s farmers, a pastor and his daughter or Jesus himself. The opening foreshadows what Damnation has been building towards since episode one. Everything is finally coming to a head. The episode’s title is “The Goodness of Men” and one has to question if there is any left. Bessie is being hunted by the Black Legion and ends up at the church. Amelia and Seth do help her and Seth even tries to shame the members of the Black Legion in the congregation by preaching about cowardly men with masks, but their circle of trust is pretty tenuous. Bessie knows that Seth framed Creeley and although she has a begrudging respect for Amelia (especially after finding out Amelia is behind those strike pamphlets), she doesn’t like how Amelia condescends to everyone. Bessie does let them know about the connection between Duvall, Hyde and the bank and that Melvin Stubbs is Grand Master of the Black Legion. Stubbs is upset about the farmer’s market at the Riley farm, so he wants to make an example of Sam Riley Jr. by hanging him in the town square. This puts Seth in the same position his brother used to be in: he knows Creeley framed Sam Jr. but he can’t get him to confess so he tries to warn Sheriff Berryman. Unfortunately, Berryman is still underestimating Stubbs and he thinks he has it under control but his deputy (who’s also his nephew because this town is tiny) believes that his uncle is corrupt and thinks Stubbs holds the moral high ground. And because he’s already gullible, he also believes Stubbs when he says he won’t hurt Sam Jr.
Creeley comes back from his side mission ready to kill his brother and regain his freedom. Coming off of these past few weeks of flashbacks, it’s heart-wrenching to watch Creeley burn the picture of him, Seth and Cynthia before setting out to commit fratricide. But of course, the best-laid plans; when he shows up to kill Seth, Bessie talks him out of it by telling him how Seth and Amelia saved her life. Seth also lets him know that he’s going to stop the Black Legion (which also protects Bessie) and then Creeley can do whatever he wants. Despite his “no new emotions” policy, protecting Bessie and finding an excuse to not kill his brother is exactly what Creeley was hoping for. Connie’s story also gains further complexity. She’s still staying at the Riley’s farm and it feels like she’s also looking for an excuse to let go of her vendetta. She admits to Brittany that she didn’t know Sal had a wife but she also tells Martha Riley that a strike blockade stopped her first child from getting medicine that could have saved her life. It seems like Connie’s husband turned to strike breaking after their child died and then he was also killed. Connie is being set up as Amelia’s foil in every way: just as Amelia has deep, valid reasons for hating strikebreakers and corrupt men, Connie has that same motivation to stop these men who she feels are responsible for the deaths of her child and husband. 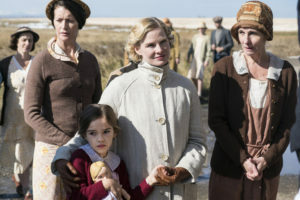 Connie’s forward action has halted this episode while she takes care of a sick Brittany, but Amelia goes with DL Sullivan to father’s factory to let the workers know about the experiments and how her family has been cheating their workers in an attempt to really put her money where her mouth is when it comes to confronting her past. Seth, on the other hand, has been running from his past this entire time and he’s run out of that good karma he was trying to build. The Black Legion takes Sam Jr. out into the town square and they plan to execute him if he won’t renounce the strike and confess to killing Pete Hollingsworth. Since he won’t do either, the Legion starts to string him up and the striking farmers try to fight them off. Stubbs, smartly, stands in the crowd pretending to be a bystander because he can’t get unmasked as Grand Master in front of the whole town and the Legion also has a machine gun (they were invented in 1862) to ward off anyone who would intervene. Seth tries to get by them dressed in the butcher’s Black Legion robes, but his cover is blown instantly and the episode ends with that ever-present noose tightening around Seth’s neck. 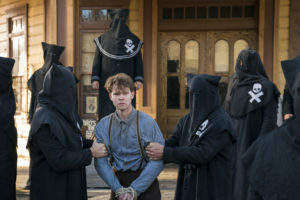 It’s interesting because Creeley is now faced with a choice: he can help his brother, which will bring Eggers-Hyde, the Black Legion and possibly Duvall down on his neck or he can let the Black Legion kill his Seth and that’s a win-win for him since it will also mean an end to the strike. This week’s 1924 flashback shows us that Creeley was too weak to stand up to his father and that weakness being what got Cynthia killed so – in a way – he owes Seth, but we still don’t know when or why Seth framed Creeley for murder. Whatever drove Seth to protect Creeley seems to have turned into resentment after Cynthia’s death and I think Creeley is actually more upset about Seth abandoning him than he is about being framed for murder. Whatever their motivations, next week will be a deciding moment for each of the brothers as they take a stance and figure out if they can stand together again. This driving song really ramped up the tension as the episode headed towards its climax. I cannot wait to see how Seth gets out of this.